Programmatic media or ad buying is the use of technology to automate and optimize the ad buying process in real-time. Programmatic ads are placed using AI and real-time bidding for online display, social media ads, mobile and video campaigns. Programmatic technology allows marketers to place ads according to predefined set of data and get it a more efficient price. This week, NBCUniversal announced NBCUx for Linear TV, the industry’s first national programmatic TV offering at scale. Last year, NBCUx launched as a digital programmatic offering make its digital video and display inventory available for programmatic buying. Beginning in the fall, advertisers will be able to use data and automation to build media plans for NBC’s TV inventory on both cable and broadcast networks. The goal of programmatic advertising is to make the price as cheap as possible, with NBCU now extending that to television, brands may be able to get more bang for their buck. The announcement comes less than a year after NBCU’s parent company purchased Visible World, a technology company that helps advertisers place TV commercials across the country that reach very specific audience. These steps will help increase efficiency and hopefully start to make TV ad buying better tailored to specific audiences. If you’ve been watching TV or on the internet at all in the past few months, you know that Deadpool was released this past weekend. 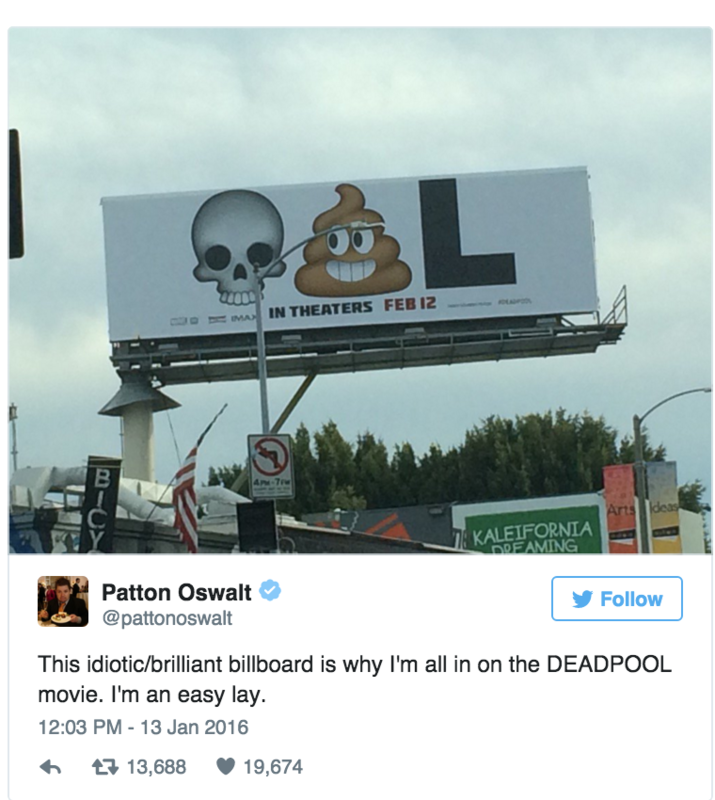 With a heavy social media campaign, Deadpool was anywhere and everyone with clever marketing tactics including: positioning as a romantic film, emoji posters, and even a PSA for for Testicular Cancer. The marketing is both tongue-in-cheek and meta with fourth-wall breaking. There seems to be little difference between the character of Deadpool and Ryan Reynolds, the actor who plays him — as much of the content has been released on Reynolds’ own social pages. 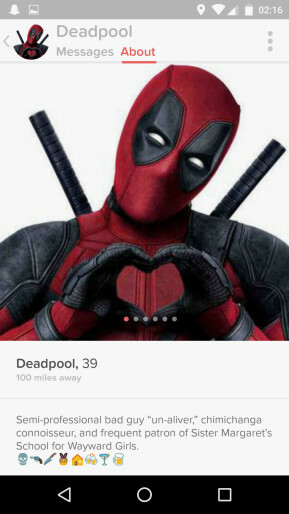 The success of the campaign can be attributed to the crazy and fun promotional stunts pulled such as Deadpool running for El Presidente, complete with his own SuperPac as well as tweeting during the premiere of ABC’s “The Bachelor” and having his own Tinder account. Other examples include an “Extra” interview comfirming the R-Rating of the film. That video has since received over 8 million views. Deadpool also counted down the days to Christmas with “12 Days of Deadpool,” with new pieces of content being distributed daily, culminating in the release of the second movie trailer. Besides attracting lots of attention for their marketing stunts, Deadpool was able to shatter box office records its opening weekend, soaring past $130 million to make it the biggest opening ever for an R-rated movie. Fox had predicted an opening weekend of about $70 million. Because of its success, 20th Century Fox is considering making the third “Wolverine” movie R-Rated. 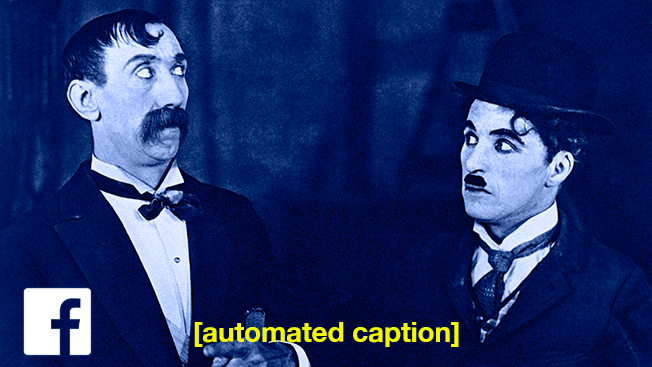 On Thursday, Facebook began offering two lines of automated captions in branded videos for free. The addition could be a new way for marketers to still use the silent autoplay feature while getting more messaging across.To make that possible, Facebook has transcribed over 50,000 video ads to help train the captioning tool to become more accurate over time. Advertisers will also be able to review and edit the automated captions before posting the video ads. Internal tests conducted by Facebook found that captioned video ads increased video view time by 12% on average. Facebook found that when video ads pop up and play loudly without people expecting the noise as they’re scrolling through their phone feeds, 80 percent “react negatively” toward both the advertiser and Facebook itself. As mobile ad revenue now accounts for 80% of the Facebook’s ad revenue, it is the most important device. Ultimately, brands achieve much better business outcomes and attention rates when mobile video formats are used — as opposed to repurposing TV content. The addition of captions will allow advertisers to better engage audiences and get their message across quickly. A study of Facebook done by Nielsen found recall increases to 47 percent after three seconds of viewing and to 74 percent after 10 seconds. Facebook also shared that 65% of the people that watch the first three seconds of a video end up watching at least 10 seconds of it. The video wall consists of four Samsung HD screens that are water and dust proof and very visible under direct sunlight. The live video will be captured by two cameras built in the front of the Volvo truck. 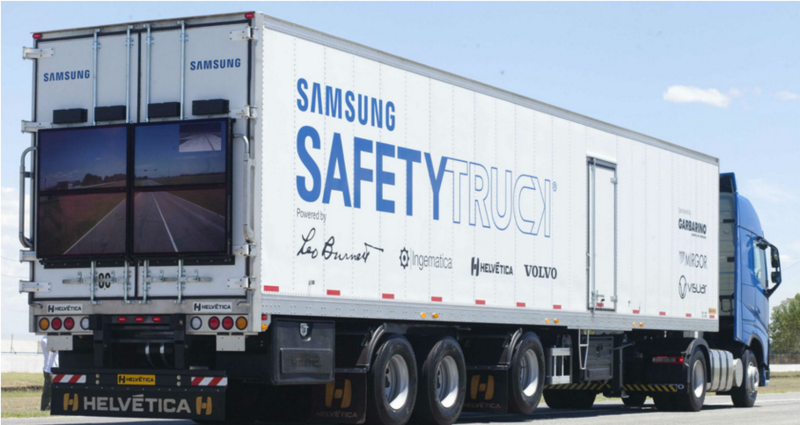 After four months of reliability testing, Samsung will roll out these trucks globally. This is an awesome initiative by Samsung and Volvo to make the roads safer. Additionally, Samsung plans to improve the system by combining the technology with truck platooning technology (trucks automatically control the distance between each other by using wireless networking). 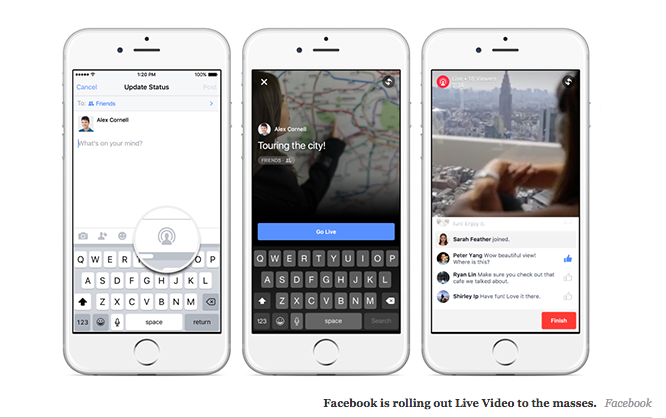 Facebook announced that live streaming will be opened up to all users in the US. Previously, live streaming was only available to celebrities, verified pages, and journalists. To use Live Video, users tap on the Update Status button and add a brief description of the livestream. Users can also customize their audience before going live. During the livestream, users will be able to see the number of viewers, the names of friends who are viewing and also a real-time list of comments. Completed streams will be saved to the Timeline, just like any other uploaded video. Additionally, Facebook users will be able to discover which friends or public figures are using live video feeds. Video is becoming more and more important on social with Facebook reporting people watch 100 million hours of video every day on the platform. With videos growing popularity, Facebook and Twitter are fighting over who will reign king for live streaming. This live stream announcement comes on the heels of Twitter’s announcement Tuesday of Periscope’s integration with GoPro Hero 4 earlier this week. Figure from Google’s patent showing how a banner could appear in street view. As companies continue to reinvent the wheel on new ways to advertise online and grab users’ attention, Google continues to lead in innovation. 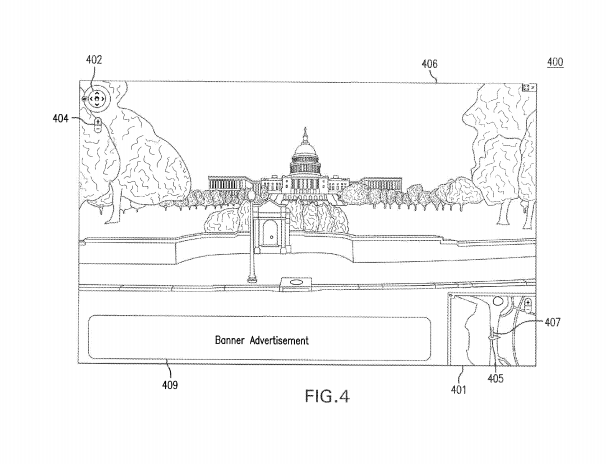 Back in 2010, Google received a similar patent to digitally transform the content on existing billboards on Street view. This would allow them to update billboard in real time or open them up for companies to digitally advertise on them. In honor of the opening of the new Star Wars film, Carrefour, a french supermarket retailer allowed customers to shop like a Jedi. 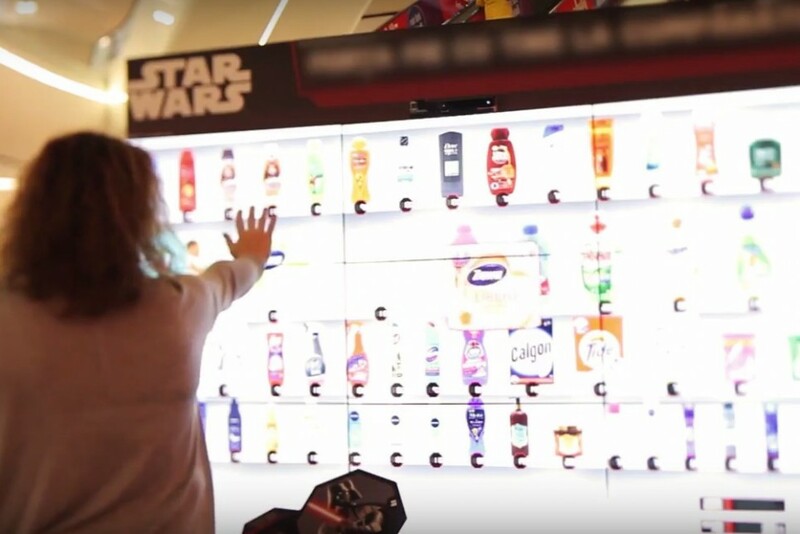 The in-store billboard utilized Kinect technology to enable shoppers in over 150 locations to use The Force and shop like a Jedi. For those who are unfamiliar with Star Wars, the Force gives a Jedi the power to perform such abilities such as mind tricks and telekinesis. The billboards tracked shoppers hand movements as they browsed through products. Star Wars toys and merchandise were also available to purchase. Once customers were done with their virtual shopping cart, the good were waiting for them at checkout. Star Wars is one of the biggest licensing opportunities ranging from the auto-industry to Subway. While this integration probably slowed the shopping process down, it was one of the more interesting executions that truly emulated Star Wars. It is no surprise that Yahoo! is shutting down Yahoo Screen after the company reported a loss of $42 million. The video hub launched in 2013 to house original and syndicated programming including licensed clips of SNL, original series (including NBC’s “Community”), live concert streaming, and a recent streaming of an overseas NFL game. If you are missing your off-air comedy kick, you can now sign up for NBC’s Seeso — a comedy streaming network. For just $4/month, users can access over 2,000 hours of content in the collection to start with including: classics like Monty Python’s Flying Circus and The Kids in the Hall on top of NBC’s own programming. Late night shows Jimmy Fallon, Seth Meyers and Saturday Night Live will also stream just a day after they air on the big network. 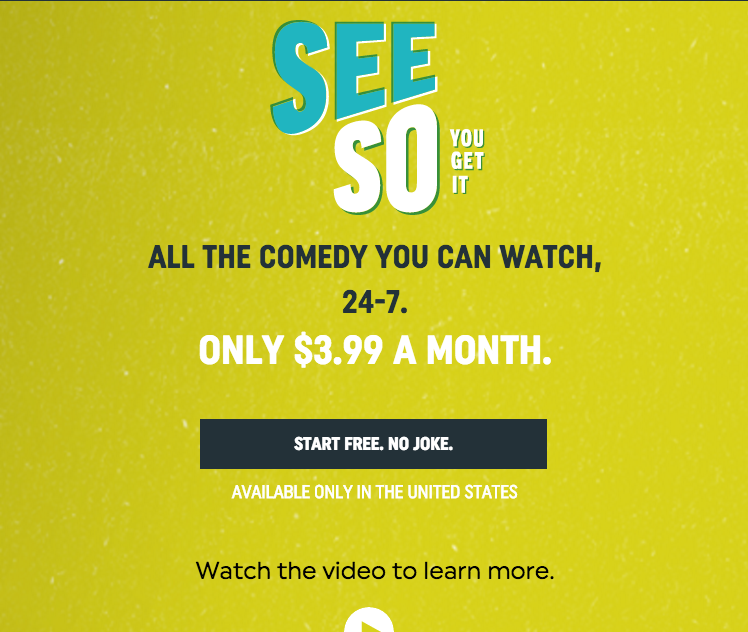 While a lot of the shows on Seeso are available on Hulu and other streaming services, SeeSo is 100% ad-free. (Hulu now has a more expensive subscription that is ad-free). When one door closes another one opens. With the rise in popularity in cord-cutting and the successes of original programs on streaming services, everyone is looking to get into the game. Yahoo Screen was a bit too ambitious with their original programming that fell flat. If Seeso is successful, you may have to diversify your streaming portfolio as they may pull their content from other streaming sites such as Hulu and Netflix.